French for little apple. It is the metal fixture that locks together the different parts of the weapon and acts as a counterbalance to the blade. It also means to strike, beat, bash, hit with the pommel. If you want to see how well-balanced a weapon is try to find the place you can rest the weapon on two extended fingers. It should balance a little past the hilt and the ricasso (the part of the blade just past the hilt that is not sharp and begins the forte). A well-balanced sword will swing easily and be controlled easily. It will feel right, not tip-heavy. Pommels can be plain or ornate, or somewhere in-between – just like your characters. This entry was posted on April 18, 2013 by Joe Lunievicz. 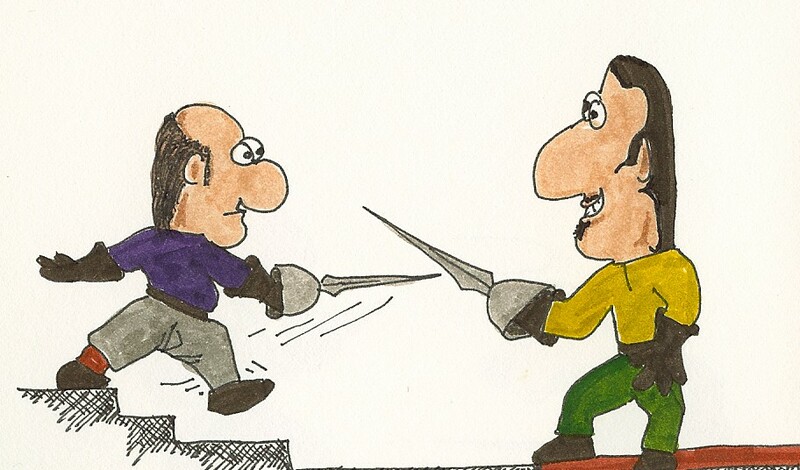 It was filed under A-Z Challenge, Blog, Fencing, On Writing, Stage Combat . Nice. So pommel can mean the same as pummel, when it’s a verb? Interesting. Yup. News to me also. Pummel has one meaning pommel two. Weird but I’m going with it. In airport right now in Arkansas . Will be stuck on DC overnight due to weather. Will have to do Q late!